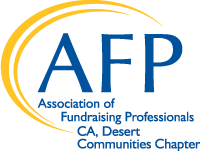 Thank you for joining us at the 2018 National Philanthropy Day in the Desert celebration! Our hearts were filled with the generosity and philanthropy of our Honorees, sponsors and guests. Well over 500 persons were in attendance at this years event as we paused to recognize and celebrate the great contributions that philanthropy makes to our communities. On behalf of the entire Desert Communities Chapter CA, AFP Board of Directors and National Philanthropy Day Co-Chairs, Judi Olivas and Gailya Brown, thank you for joining us and celebrating our wonderful honorees and the spirit of philanthropy in the Coachella Valley.